Sadie and Olivia, along with their classmates, each colored cards to be sent to U.S. troops serving away from home this holiday season. The activity was part of the schoolwide service project for November to participate in Operation Gratitude, a non-profit organization that facilitates letters and care packages between citizens and military and first responders. Students came together to create and color cards for the troops. They included in the cards their greetings, as well as their appreciation for our military’s service. “My parents are Veterans,” Beckett Tayler, an eight-grader, said. “I know it’s hard to be away from your family, especially at Christmas. We want to thank [the troops] for their sacrifice.” Over 240 letters were sent through Operation Gratitude for the troops. The Letters to Troops project was the second service project Mother Seton School students have participated in this year, which has been christened the “Year of Service: Created for Good Works” by the Archdiocese of Baltimore. In October, the school set a goal of creating 100 Jared Boxes as part of The Jared Box Project. Through donations from students and their families, the goal was met and 100 Jared Boxes, which contained items for play and creativity meant for hospitalized children, were delivered to Carroll County Health Center, Waynesboro Hospital, Frederick Memorial, and Gettysburg Hospital. MSS, whose stated mission includes inspiring “students to…dedicate their lives to love and serve Christ in the tradition of St. Elizabeth Ann Seton and St. Vincent de Paul,” has always put outreach and service to others at the core of their community. “The Love of Jesus Guides Us” is not only the school’s own theme for this year, it is the principle by which the administration, staff, faculty, and students are led. “As a Christ-centered community, we truly believe it is our responsibility to not only provide strong and challenging academics, but to form our students to seek the good and serve others,” said Sister Brenda Monahan, D.C., principal of Mother Seton School. Though December is a short month due to the Christmas break, that didn’t stop students from continuing their outreach efforts. December’s service project was to collect items for homeless students in Frederick Country as part of the Student Homelessness Initiative Project (SHIP) Homeless for the Holidays initiative. Students collected full-size personal care items through January 4, 2019. The project fittingly closed on the Feast of Elizabeth Ann Seton, our foundress and patron saint. To see how you can help students with their outreach efforts, visit MotherSetonSchool.org or call 301-447-3161. 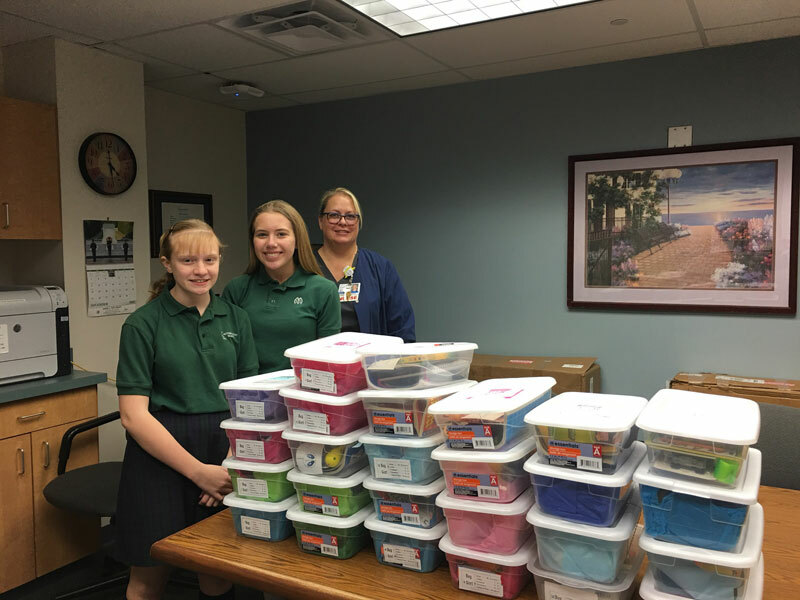 As part of a monthly schoolwide service project, Mother Seton School eighth-graders Mackenzie Orndorff and Layla Metts deliver Jared Boxes to Carroll Hospital Center Emergency Department. Krista Johnson, Quality and RN Stroke Coordinator, accepted on behalf of the hospital.